My Watermelon Moon: Balloon Ride Blog Hop! Hooray! It's Blog Hop Time! 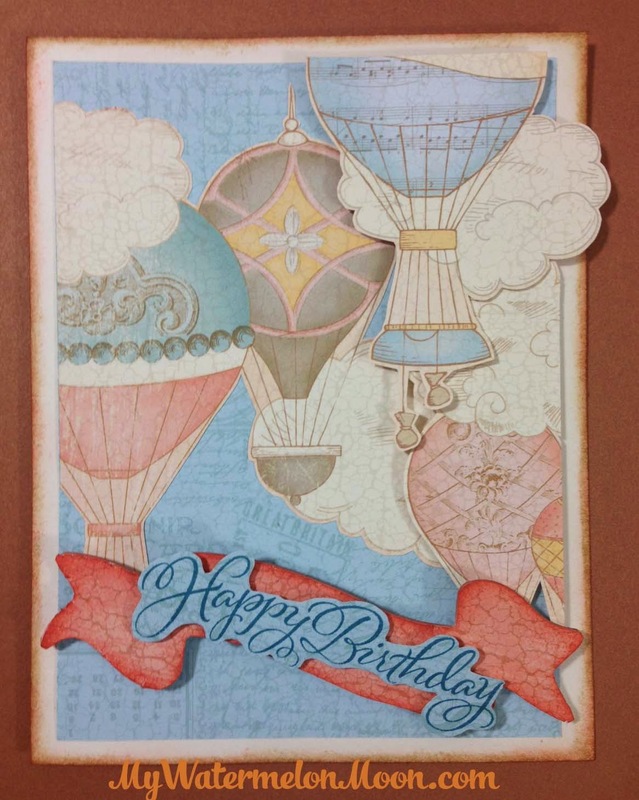 Welcome to the Damask Divas May Blog Hop featuring the beautiful Balloon Ride Paper Pack! If you came from MyPassionforScrapbooking, you are in the right place! If you have jumped here and just discovered our blog hop, feel free to check the list at Damask Divas blog to find the complete list of blog hop participants. For today's project I really wanted to showcase the beautiful balloons featured in this pack. I took time to "fussy cut" several of the balloons on the page and affix them with different sized foam tape to give several layers- which of course is hard to see in a photo :). I used a banner from my Artiste collection chipboard pieces, and the Happy Birthday sentiment from the super versatile Joyful Birthday collection. The edges of the card were distressed with desert sand and sorbet inks, and the banner with sorbet, which pairs along perfectly with this collection. I hope that you enjoyed today's card and that you feel as inspired to create with this paper pack as I do! The next blog on the list is Aime Kiger's blog. Hope you have a great time on our hop and checking out all the creations using the beautiful Balloon Ride paper. If you get lost, just hop on over to Damask Divas blog for the full list. Oh My Goodness!!! I love all of the layers and the colors are perfect. I just love this paper. Great job! Love your card!! Super cute!! Beautiful card! I really love the balloon ride theme!